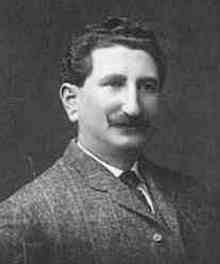 Harry Bernstein (1856 - 1920) was in his day (1880 to the first decade of the 20th century) one of the most effective ward bosses, delivering the immigrant vote to the Republicans. He also served one term (1903-05) representing Ward 4 on City Council. He was an immigrant himself, having been brought to Cleveland in 1868 from Russia-Poland by his parents. Educated in the public schools, he was 25 years old - and wise in the ways of the city - when the great wave of Jewish immigration began in 1881. "Czar Bernstein", as he was often called, was also an entrepreneur. He owned Yiddish theaters, a saloon, a hotel, and more. Bernstein's political power waned early in the 20th century as Italian immigrants moved into his ward and Jewish voters moved steadily east and out. His funeral in 1920 was attended by 900 persons and he was praised for his many good works. The above photo of Bernstein's Elbow is evidence of the influence of Republican ward leader "Czar" Harry Bernstein. 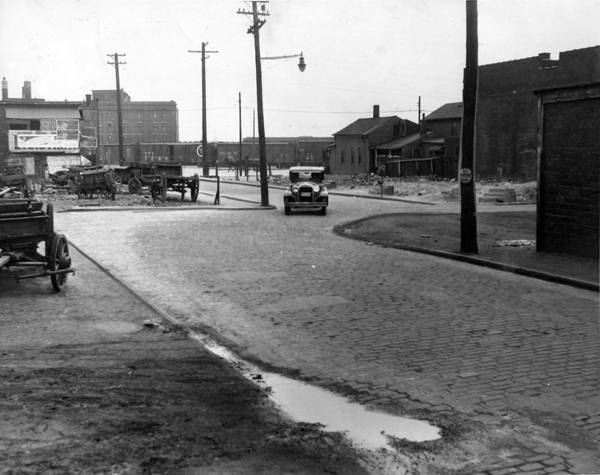 During the 1890s a Cleveland street, not far from the industrialized river valley, was given two extra bends to avoid disturbing a business he owned - probably the saloon in the upper left of the photo. 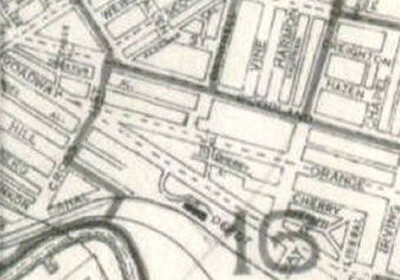 At the right, a segment of a 1900 map shows Bernstein's Elbow near the center. It was on what is now East 14th Street (until 1906 north-south streets had names, not numbers), south of Woodland Avenue and north of Orange Avenue. Bernstein's Elbow is long gone, except in old maps, some books and this page. Source: Cleveland Public Library's Image Collection. Encyclopedia of Cleveland History Harry Bernstein. Thanks to Bill Barrow (CSU) and Peggy Campbell for tracking down the location of the elbow.